Wouldn’t exactly call us Sal Paradise and Dean Moriarty, but BK and I have been on the road. In the continuing story of our basement digs, we decided it would be a good idea to stick together and travel. A lot. Especially for the first two weeks, that’s the magic number on getting a connection to the internet. The lines are old and excavation is involved. Basement, no internet, lots of dirt. After moving everything in, we spent one night in the cellar and headed out the next day for the Brooklyn office. That’s what my room in the apartment has become, (just fine with me.) Couldn’t have picked a better time to wander upward. The east has its fall face on. Fantastic. The 95 corridor is lined with brilliance. Here’s something I’m sure you’ve never heard, fall is my favorite time of year. Have you ever met anyone who hasn’t said that? Wracking…thinking…ah, no. And no wonder, it’s gorgeous. Transformative, literally and figuratively. So, Brooklyn was stop number one. A quick visit, but eventful. Sarah let me tag along to a gallery opening. It was in honor of Drake’s birthday, (the Canadian rapper, singer/songwriter; does a little acting too.) Popular guy. The artists in the show all had images of Drake, (mixed in with other subjects.) Successful night, the gallery was packed. One of Sarah’s co-workers, Janine Doherty, was exhibiting; talented artist. And because of some astute marketing on the part of the ladies who put the show together, (primarily a well placed call to the New York Times,) I believe JD sold her, 50 Shades of Drake, for a healthy sum. Bravo, well deserved. Before we got on the road to head further east, I hit my new Sunday jam in Brooklyn, St. John the Baptist Catholic Church. In my endless search for meaningful church connections, I landed on a gem. Have visited quite a few in the hood, but this one is unique, at least for me. It’s an African-American church. Most people would say I stand out like a sore thumb at mass, but that’s not how it is at all. It’s a welcoming community that celebrates love. Bingo. That’s all I need. People who gather to nurture love. Amen. The wheels on the car go round and round. When you talk about the perfect picture of fall, there’s nothing like New England for a masterpiece. The roads to Boston are breathtaking; colors that don’t seem possible, translucent in their luminous radiance. 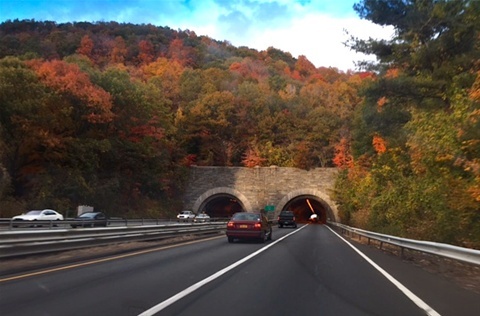 Road trips in the fall are medicinal; I welcome the remedy. Thankfully, BK had some business in Boston and he took me along for the ride. We dropped Jeter, the jet-setting beagle, off with the kids and got a couple days of Continental Breakfasts and freedom from moving and construction. I’m sitting at a hotel desk, (satellite offices a plenty,) relaxed in the knowledge that I don’t have to move, plant, or scrub a thing. Sadly, all good things must come to an end; we head back tomorrow. Going mobile once again, back to reality. Swing by to pick up the Jeets in NY, then back to the basement in PA; going to be a long day on the road. But I look forward to it, this road trip has been good medicine. Being on the road with BK always is, it’s one of my favorite things to do. But this one, in particular, has been a tonic. It goes beyond just the beauty of the season, it’s the beauty of everything I saw. Not sure I can put it into words; I won’t do it justice. But for the last few days, I’ve seen Americana, at its best. People, just living their lives. All walks of life. It didn’t matter where I found myself, the trees were a blaze and pumpkins decorated the stoops. We’re not so different, all of us.